A moment of absolute serenity. 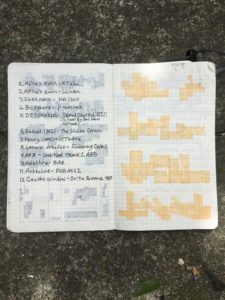 If you’ve read Lucas Dupuy’s latest interview at Floorr Magazine, you are aware that he has previously titled his works with names of album tracks; and that playing electronic music has become his most “concrete and sacred ritual” while working at the studio. Indeed, if you’re looking for a mix to actually feel inspired, here it is. The tiptoeing bass-lines, the constantly mutating patterns, the synth tones, and the strange noises that I’d be unable to identify even if I tried are very much reminiscent to Lucas’s blurry yet bold works that contain a fluidity of changing patterns and quick rough marks. We hit Lucas up to see if he’d be down to put a track list together for us with the same vibe he usually listens to at his studio, and for our surprise, he sent us his very own remixed Mix!. Usually we contact artists and ask them to send us a track-list so we can place the songs together, but Lucas edited and mixed this one himself.